While double strollers are convenient, they are often priced ‘a bit’ on the high side. Let’s face it, even if you’re doing quite well financially, the costs of raising two kids do add up to a LOT! Parents who spend wisely can better use the money for more important things such as vacations, healthcare and education. 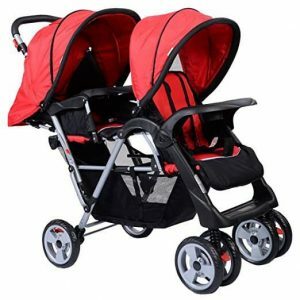 In this article, I’ll help you to save some bucks by revealing the best deals on cheap double strollers. While these strollers are inexpensive, they’re certainly not lousy. In fact, this list contains some of the best-selling cheap double strollers in the country, simply for the fact that they’re amazing value for money! I came up with this list after days of painstaking research and have only included strollers with the best safety ratings, company history and customer feedback. The price tag on this one is lower than Barry White’s Voice. When I first came across this double stroller, I thought that it has to be a piece of junk. How can such a cheap double stroller be any good? But I was wrong! Imagine my surprise when I found out that not only does the City Street LX have amazing reviews, but it’s also got a long list of certifications. 4) The stroller has a lightweight aluminum frame. It weighs only 23 pounds and is suitable for children weighing up to 35 pounds each. 5) It has a quick and compact umbrella fold. This makes it travel and storage-friendly. 6) 5-point safety harnesses with soft shoulder pads ensure a safe ride. Seats can be reclined for kids’ comfort. 7) Easy to maneuver thanks to shock absorbing 360 degree swivel front wheels. 8) This model is eligible for free replacement parts. (Subject to terms and conditions). 9) Large Canopy protects the occupants from bright Sunshine, dust etc. 10) Two large storage pouches for basic supplies plus a cup-holder so that you don’t have to juggle your drink around. 11) Stroller is 31.2 inches wide. Actually Fits through a standard 30-inch doorway. 12) Can be assembled in minutes even if you’re not a technically savvy person. 1) Height is 37.3 inches. This is not really bad as the industry average is somewhere around 40 inches. However, handles are not height-adjustable and hence taller people may have to bend down slightly to push the stroller. 2) Canopy needs to be larger. 3) Not compatible with car seats. Although the City Street LX is not fancy, it’s still a fantastic stroller for the price. Perfect for budget-conscious buyers. The Scout is the definition of ‘cheap’ and ‘functional’. It weighs in at just 18.3 pounds and yet, each seat can hold a kid weighing up to 35 pounds. J is for Jeep is a well established brand and just like all their products, the Scout double is JPMA certified. It also confirms to or exceeds all applicable ASTM and CPSC standards. 1) Both seats recline to multiple positions and have 5 point safety harnesses with soft shoulder pads. 2) Large extendable canopies with visors provide Sun protection. At the rear there are two canopy bags for storing supplies such as diapers, toys etc. 3) The stroller has 5.5 front swivel wheels with front suspension. While it is not meant for off-roading – it can definitely handle small bumps and irregularities. 4) The stroller is easy to fold and occupies very little space. The two seats are side-by-side and yet the stroller goes easily through a standard (30 inch) doorway. 5) Bits of the Scout are covered with reflective material to enhance visibility in poorly lit areas. 6) The caregiver gets a cup-holder to keep their drink. 7) The stroller is fairly easy to assemble and live with. 1) Not compatible with car seats and hence not suitable for infants. However, the seat does recline and the 5 point harness holds the baby in place securely – kids who don’t require head support should be fine. 2) As this is an umbrella style stroller, the handles are non-adjustable. They may be a little low for taller people. Height is 37 inches. The J is for Jeep Brand Scout Double is great for buyers who’re looking to save some money but don’t want to compromise on safety and quality. Most people who’ve used it cannot stop raving about it. This double stroller is perfect for growing families. It offers lots of possibilities in terms of seating arrangement. Often, older children are not very enthusiastic about getting into a conventional stroller seat. Kids, by their very nature are quite playful – they want to sit this minute, then stand after 5 minutes. They feel like strolling around for a bit and get tired and want to take a seat again. The Sit and Stand Ultra Double Stroller caters to these requests. It fact, it does a lot more than that. Let us find out. 1) The stroller can accomdate one or two Baby Trend car seats. However, you’ll have to buy these separately. 2) The stroller can take two children weighing up to 50 pounds each. 4) The stroller has cup-holders for both kids and parents. There’s also a separate covered parent tray near the handle that has space for grown-up stuff like keys, mobile phones etc. 8) A win for budget conscious buyers. Very well priced for what it offers. 1) Hard to steer when fully loaded. Ride is decent but not as comfortable as strollers that have all wheel suspension. Baby Tend rules the roost when it comes to the best double strollers. The fourth model on our list is the Sit N Stand Ultra. Just like the other two Baby Trend strollers described above, this one too offers a great combination of practicality and affordability. The stroller can accommodate two kids weighing up to 50 pounds each. 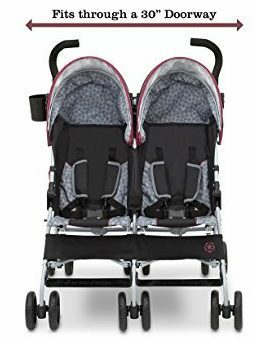 They both can either be strapped into the removable stroller seats or the rear seat can be removed to expose the Sit N Stand setup – a padded jump seat and a footrest. The older child can either sit on the jump seat or stand on the footrest…just like mom and dad. The stroller can also accommodate car seats that are sold separately by Baby Trend. Other brands’ car seats may also be compatible. 3) In all strollers, front wheels are the first thing that comes into contact with bumps and other obstacles. This usually causes the stroller to jerk and makes the ride hard and unpleasant. However, the Sit n Stand Ultra double stroller has front wheel suspension. This helps to absorb most of the shocks and enables your kids to have a happy and comfortable ride. The side-by-side (tandem) seating with independent seat recline makes life easy for caregivers. It means that the kids will not fight over which position the seats should be reclined to – each one can have it according to personal preference. Also, after talking to a bunch of parents who use inline double strollers (one seat behind the other), I found out that children squabble a lot over who gets to sit at the front. The tandem design makes both children feel equally special! 1) The Cloud weighs just 21 pounds. It can hold two children weighing up to 35 pounds each. 2) Can be folded swiftly in a matter of seconds. Needs very little storage space – fits easily in the back of even small cars. 3) Looks really cute. The canopies have visors and hood covers; they provide great coverage and shield against UV rays. Moreover, each canopy is independent – perfect if one kid wants to soak in a bit of Sun while the other one takes a nap. Stroller also comes with a cup-holder for parents. 4) On hot days, the seat backs can be rolled up to improve air circulation – this keeps kids cool and happy. 5) Both seats are equipped with padded 3-point safety harnesses. 1) Stroller has absolutely zero storage space. 2) Cannot hold a car seat. Also, the 3-point safety belts are not suitable for infants due to lack of shoulder straps and head supports. The Kolcraft Cloud is a bare-bones double stroller. We’re not asking for premium features at this price but a storage compartment would have made it much more practical. Kolcraft has named this stroller ‘Cloud’ – probably because it’s as light as one and provides shade from the Sun. The Caboose was designed for families with two kids of different ages. Instead of having a conventional tandem or inline design, it has just one full-size seat and a bench seat and foot-board at the rear. The younger child goes in the front-seat and the older child can either sit or stand at the rear. If the elder one gets fed up of riding on the stroller, he/she can simply jump off and walk along. This arrangement is perfect for toddlers who love to explore their surroundings. It makes them feel empowered and independent. Instead of thinking of the Caboose as your run of the mill standard cheap double stroller, consider it to be a single stroller which can also accommodate an older child when needed. It has the compactness and maneuverability of a single stroller but it holds two kids! Parents also have the option of converting it into an inline double stroller by purchasing the Joovy rear seat accessory. 1) The stroller comes with a universal infant car seat adapter that is compatible with almost all major car seat brands. Please refer to the Joovy website for additional details. 2) The seat reclines to three positions and has a smart canopy with extendable Sun visor. 3) The ride is smooth thanks to all wheel suspension. The wheels turn well and the stroller can be pushed and steered effortlessly. 4) The seat, the bench seat and the platform all have a carrying capacity of up to 45 pounds. 5) Linked parking brake ensures that the occupants are safe and within reach at all times. 6) Storage basket holds supplies and the child-tray facilitates feeding. 7) If you live in a place where in rains often, you can purchase a rain cover separately. 1) Does not have a parent tray or cup-holders. These are available as additional accessories. 2) Ergonomics may not be ideal depending upon the height/age of the older child and the position of the seat and canopy. The Joovy Caboose is very well built and comes with a two year warranty, which is significantly more than what other brands offer. Definitely recommended if the design suits your purpose. Even though this is the most expensive stroller on our list, it’s still quite affordable and more importantly, it’s built to last. Chicco is a well-known brand and their products are usually well-designed and reliable. 1) The stroller features two comfortable seats in a side-by-side (tandem) arrangement. Both seats recline independently to 4 positions and have adjustable footrests. Each seat can hold a maximum of 40 pounds. 2) Kids remain securely strapped in thanks to 5-point safety harnesses. Stylish canopies keep the Sun out. Rear canopy panels can be closed or opened to control air-flow depending upon the weather. 3) The swivel-lock dual front wheels ensure ease of steering. The handles are fairly high (41+ inches). Even taller people can push it without having to hunch too far forward. 4) Folds quite compactly and has a carry convenient carry strap. 5) Big mesh storage basket. 1) The stroller has only one cup-holder. There’s no child tray or parent organizer. 2) Being a tandem double stroller, it is fairly wide. Also, at 34 pounds, it’s a little heavy. Unfolded dimensions are 30.75 x 33.5 x 41.5 inches. 3) It is impossible to install car seats onto the frame. Hence, the stroller is only usable for children who are more than 6 months old. All-in-all, The Chicco Echo Twin Stroller looks sharp, has a roomy storage basket and the seats are comfortable. Car seat compatibility would have made it a sweet deal. This is a proper, full-fledged double inline stroller. It has a good number of features and buyers do get a lot for their money. The stroller has a stainless steel frame and accommodates two kids with a maximum weight of 33 pounds each. 1) The seats have breathable non-toxic Oxford covers. Each seat reclines to multiple positions and has five-point safety harnesses. The footrests are adjustable too. 2) Has a large storage basket and gets removable child tray with cup holders. 3) Some parents have managed to install infant car seats. (However, there is no official word by the manufacturer in this regard. Car seat compatibility is a bit of a gray-area). 4) The swivel lock wheels enhance maneuverability. They certainly aren’t all-terrain wheels but work fairly well in urban settings. 5) Assembly is pretty straight-forward. Takes only a few minutes if you follow the manual closely. 1) Styling is a bit subjective. Design is OK but color combinations and patterns may not be to everyone’s liking. 2) No parent tray. Also, the stroller is difficult to fold up. Of course it’s not rocket science but it’s cumbersome and just does not compare with some of the strollers that have an almost instant, one hand fold. 3) Build quality has a ton of room for improvement. Frankly, this is an honest effort by Costzon, which is not as well known a brand as Baby Trend, Chicco, Jeep and so on. 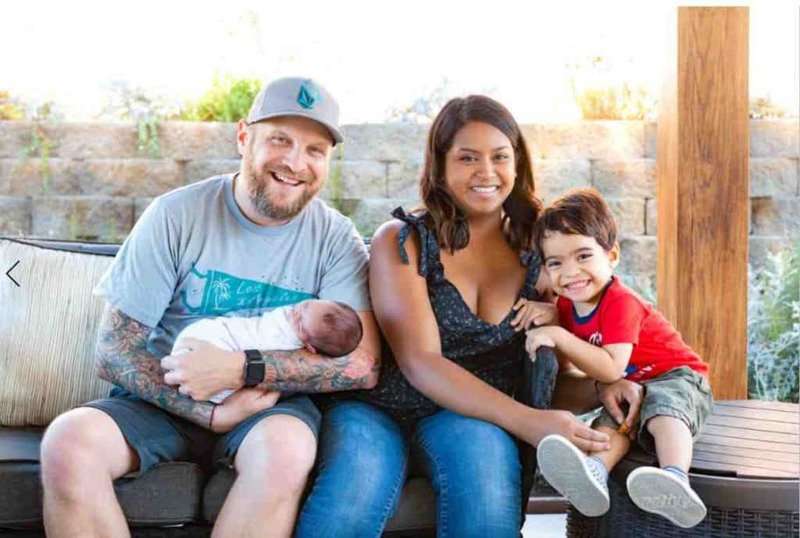 Their stroller is priced higher than the cheap umbrella double strollers but much lower than other models with similar specs – which is why many parents are going to consider and a good number will end up parting with their money as well. Note: This stroller deserves to be higher up. The only reason it’s featured up at 9th place is because it is a bit expensive. Tremendous value for money though and ideal for parents who like to stay fit. 5) Convenient and effective rear foot break ensures that the stroller stays in place even on inclines and uneven ground. 3) The seats have a side-by-side stadium configuration. This makes the stroller wide. (Width is 31.5 inches). This stroller has a few limitations but it is a great ‘niche’ product for those who like to stay on the move. The 3D two double features a stadium style (inline) configuration. The rear seat is placed higher than the front seat (just like in a sports stadium). This way, both the kids get to enjoy a good view of their surroundings. The two seats can hold a combined weight of up to 75 pounds. 1) The seats recline to two positions and have removable and adjustable Sun canopies with peek-a-boo windows. The canopies block out 99.9% of UVA and UVB rays. 2) The stroller can be folded with just one hand. It locks automatically upon folding and has a carry strap. 3) Lots of convenient features like a large storage basket, parent tray, additional storage pouch, 5-point safety harnesses, front swivel-lock wheels and foot activated parking brake. 4) The front wheels can be locked for going over straight paths. They swivel smoothly while crossing busy areas with lots of people and obstacles. Summer Infant claims that the wheels can handle cobblestone streets and grassy areas as well. 1) The stroller is not compatible with infant car seats. 2) Lots of quality issues. The customer feedback for this model far from satisfactory. Even though the specs and features look very good on paper, the price of this stroller simply does not justify the poor quality. I advise looking at other cheap double strollers on this list. Summer Infant is a good brand but this particular model has not gone down well with parents. Do let me know which cheap double stroller caught your eye and why. Also, did I fulfill my lofty ambition of saving you some money?